This post is a little wordy. For a quick review of the race itself, scroll to the bottom. 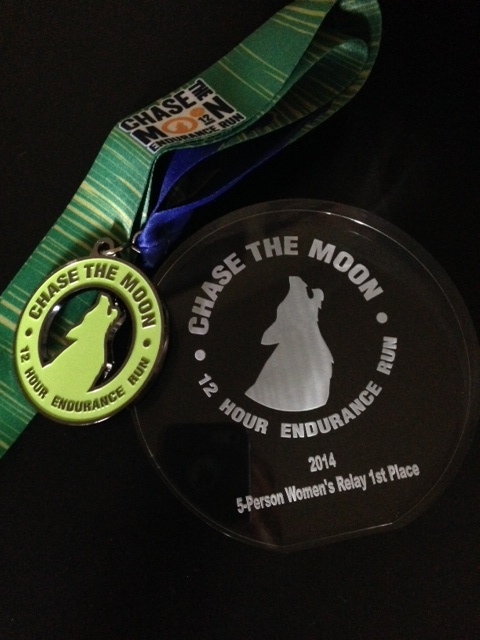 A few months ago, via Twitter, Logan started trying to convince Amy and me to run this crazy, all-night trail relay called Chase the Moon. Though the thought of running trails at night scared me, I decided that it’s good to do scary things sometimes, so I agreed to it… especially after we assured one another that none of us were, in fact, serial killers (none of us had met in person at that point). And so, Team Cereal Killers was born. Later, we managed to talk Aimee and Brooke into joining the team, so we moved into the five-person division. 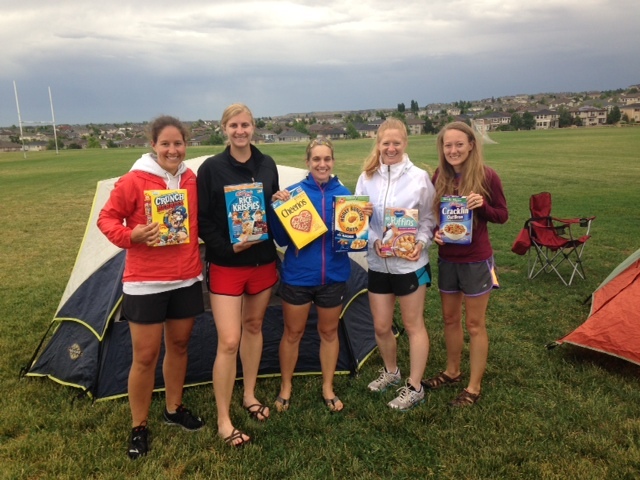 Last Friday night, Team Cereal Killers met for the first time, ready to take on Chase the Moon. Logan, Brooke, Amy, me and Aimee. And our cereals, of course. The race started at 7 p.m., so Jordan and I left home around 3:30, planning to meet the team between 5:30 and 6. As we drove, rain started pouring down. As it rained harder and harder, I got more and more nervous. I never run in the rain… because it hardly ever rains here, and when it does, it passes quickly. This storm was a typical quick-mover, thank goodness, so by the time we all met up, put up Amy’s and Brooke’s tents, and took a group photo, the rain had slowed to sporadic spits. By race time, it wasn’t raining at all. It was, however, humid (to me. Logan, who lives in D.C., thought it felt delightful). I was our team’s first runner, so at 7:00, I lined up at the start to listen to instructions and the National Anthem. And just like that, we were off! I started WAY too far back, which meant I spent the first mile or so weaving, which is never good (but which I always do, somehow). Eventually, the crowd thinned, and I settled into a comfortable pace. My plan was to run nice and easy, at long run pace, since I was counting my two loops as my usual long run. And then I hit the first aid station at mile 3.7, and they told me I was the first woman through. That’s when Competitive Cassie came out. I didn’t care that there were still over 11 hours in the race. I was first right now, and I was gonna stay first through the first loop. And this is why I can never do a race as a training run: I am mildly crazy. I picked up the pace a little (the long downhill stretches helped). Since it was still daylight, I also got to enjoy some gorgeous views of the sun setting on the foothills and the city below. No, I did not take a picture. I was WINNING, remember? Before I knew it, I was back at the start, where I handed off the baton to Aimee, and she took off. Thanks to Logan for this picture! Aimee handed off to Logan, who handed off to Amy, who passed the baton to Brooke. I have no pictures of this, because it was dark. All the pictures I attempted looked like nothing. When Brooke got back at around 3:30, it was my turn again, so off I went. I knew my second lap would be much slower than the first because of the whole darkness thing, so I told myself to just take it easy. My Garmin beeped at mile 1: 8:35. Not too bad, I thought. Then, at mile 1.3, I tripped over a big nothing and fell flat on my face. Awesome. I broke the skin on my knee and filled my water bottle cap with mud, but I wasn’t hurt. I assumed that was the universe telling me to not get cocky, so I slowed down considerably and paid closer attention to my feet. Thankfully, I had no further incidents, and I actually enjoyed running in the dark. It was quiet and peaceful (but there were other runners out there, so I felt safe), and the full moon and city lights below made for some pretty sights (on the rare occasion that I looked up post-fall). I finished my loop in the slowest time I’ve ever run ten miles, and my team told me that unless I wanted to run again, we were done. The race directors (and website) had originally said they’d cut the loop down to 10k between 5:30 and 6. Since none of my teammates were up for another 10 miles, they had asked the race directors when the loop would be cut down, planning to wait and run the 10k loop. They were informed that the course wasn’t being cut down after all. Since all of us are training for other races and none of us were dumb enough to risk pushing too hard on another 10-mile loop and getting injured, we called it quits after 61.8 miles and 10 hours. Somehow, even quitting early, we managed to win the women’s five-person division (there were only two other teams in our division), so all of us except Aimee stayed for the awards (she had an hour’s drive home and needed to get there before the lack of sleep caught up with her). The medals glow in the dark. So do the race shirts. That’s pretty nifty. The course. It was a pretty course, not at all technical (a major bonus for a night run), and very well-marked. Orange paint, ribbons, signs, and glow sticks marked the way, and anywhere you could possibly get lost, a volunteer was stationed to keep you on the right course. I have the worst sense of direction in the history of directions, and even I had no trouble staying on course. Also, it was cool to look back and see all the little lights from headlamps bobbing along below. The volunteers. These people were amazing. They stayed up all night, too, but I never even saw one yawn. They were peppy, encouraging, and ready to help with anything. The support. Water, Gatorade, and snacks were plentiful — more helpful for the solo runners, I’m sure, but nice for us relayers, too! The solo runners. Seeing people of all ages and sizes running for 12 solid hours was inspiring. 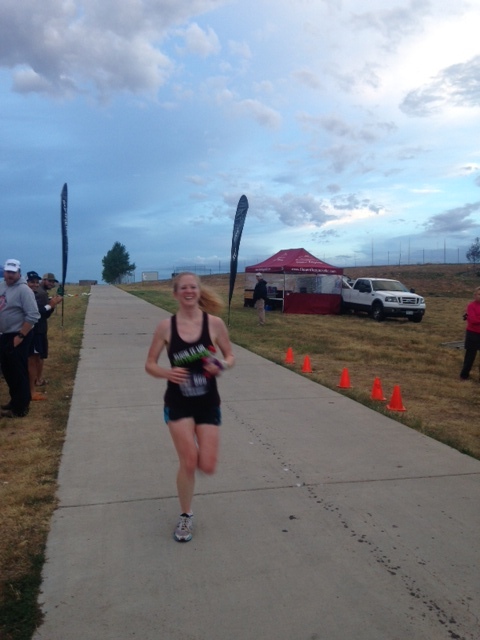 The solo race winner (a woman) ran over 70 miles in the 12-hour race. She is amazing. There were a couple of negatives, but any inaugural race is bound to have some hiccups. I’m sure the race directors will work them out for next year. The washing-machine style loops. Odd-numbered loops were run one direction, and even-numbered loops the opposite. I understand why they did it this way, but it got a little confusing in the wee hours, and I really didn’t like scooting over as I met people in the dark. I was afraid of a twisted ankle. This is not a deal-breaker, though, especially since that’s just my opinion and I’m sure some people liked it. The last-minute distance change. This will be a really easy fix for next year — either they’ll do the cutdown to 10k, or they won’t advertise that they will. It just threw us off because everyone was on training plans and had certain mileage planned, and it was frustrating to have those plans foiled. Again, not a deal-breaker, at least not for me. Would I do this race again? Maybe. I definitely prefer daytime running — I loved seeing the scenery on my first loop and didn’t love the undivided attention on the trail in front of me on the second. BUT… next year, the race is July 31-August 1. August 1 is my birthday. That means that if I ran three loops, I’d turn 30 while running 30 miles. And that might be too cool to pass up. Would you do or have you done an all-night run or relay? Want to be on my team next year and ring in my 30th with me? I think you just answered your own question about running it next year. 30 on your 30th? That’s a yes. YES for 30 on 30th! And I will be your teammate again (if you’ll have me, that is). I still find it funny they were concerned about the lack of beer on the course and we were still thrown off by the lack of the 10K! Of course I’d love to be on a team with you again! Yes! I do! That race looks awesome and what a cool way to celebrate your 30th birthday. You’ve got a year to plan… come run it with me! I laughed so hard imagining you guys running into the start/finish yelling cereal killer! I have yet to do a night race or run, but have been wanting to. Congrats on a race well run! I was nervous about the night run, but it was awesome. You should do one! That looks like such a fun race! 30 on 30 is awesome – I’d totally do that! That is very cool that your medal glows in the dark! And yes, you should totally do 30 on your 30th 🙂 Congrats! Now, am I missing the point? Were you doing this relay to see how many miles you could do in 12 hours and was the “loop” 10 miles but it was suppose to be 6.2? I think I may have missed that in both yours and Brooke’s post. 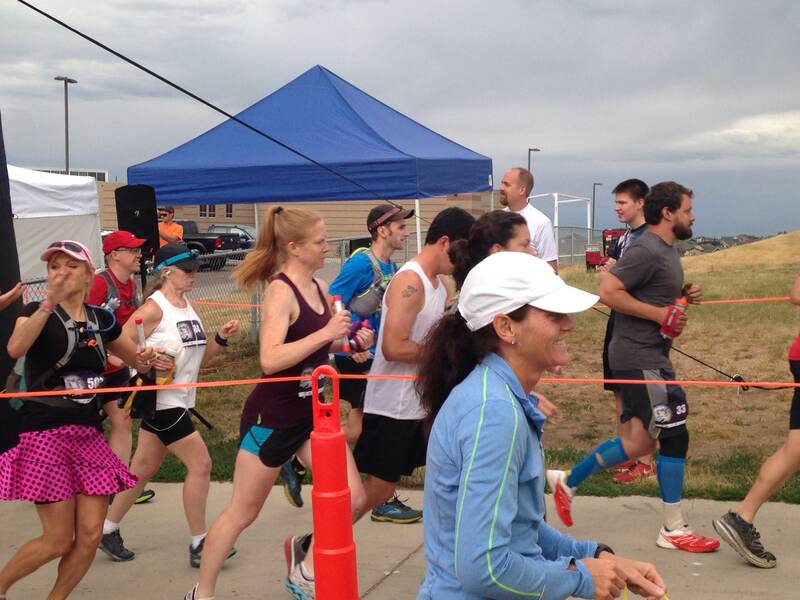 We are planning to do Ragnar next year – can’t wait! The goal was to get in as many miles in 12 hours as possible. The loop was 10 miles, but they originally said they’d cut it down to a 10k loop around 5:30 a.m. Instead, they kept it at 10 miles. Does that make sense? and no Bet365 promo code is required to say this bonus provide!